So we took a little trip to Anthony Thomas, which as it turns out, is about 2 miles from our home! There we toured the largest family owned chocolate factory in the East and their 100,000 square foot candy making facility. 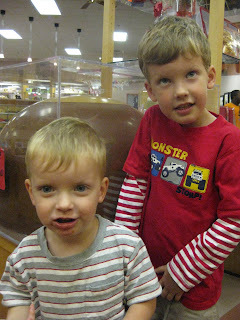 You can see G still enjoying his Buckeye, while R tries to figure out how to shimmy into the glass case surrounding a 250 pound Buckeye candy. We learned quite a bit, including the fact that a full sized tanker truck full of melted chocolate delivers at their facility every other day. I may need to do some quality control next time that truck rolls into town. As the summer begins to wane down, I am trying to put my head around the fact that R starts kindergarten in 3 weeks. I am enjoying lots of time with my big boy before the big day...on that note, we are off to the pool now! We have that same Curious George book at home!! I like it.